Do you ever feel like you are taking a multi-vitamin just because you know it's the right thing to do? Do you know if it is even making a difference in your health? Or perhaps you are taking several different vitamins for a wide range of reasons, or maybe you aren't taking a multi-vitamin at all! Chances are the mult-vitamin that you are taking isn't doing much for you and you are spending money on a product that isn't working. “Cheapest” isn't always best when it comes to nutritional supplements. 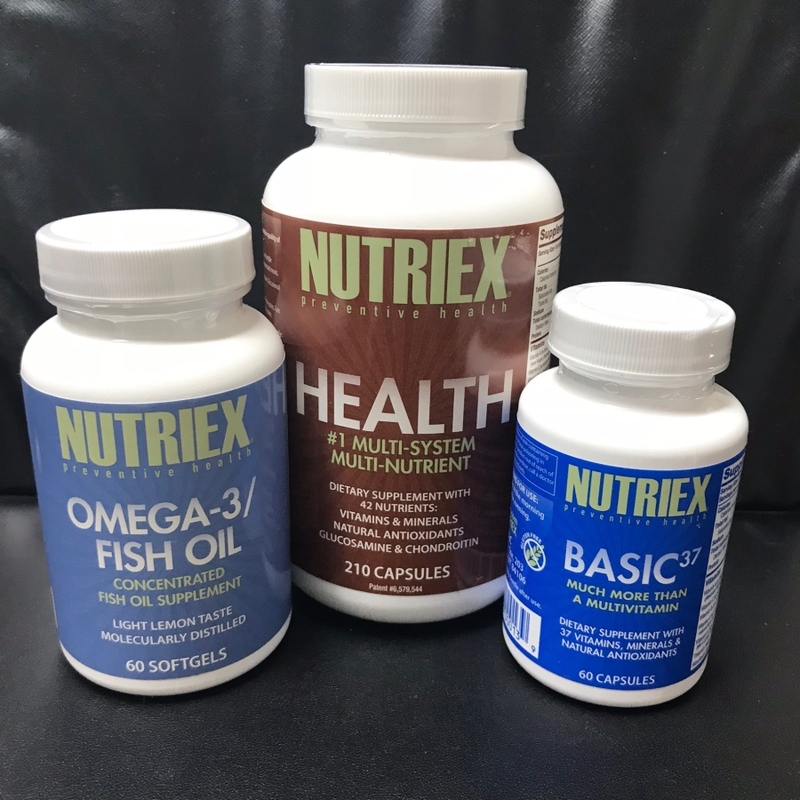 Nutriex Nutrition was created and is run by a panel of expert doctors in preventive cardiology, immunology, gerontology, exercise science, nutrition and other backgrounds. They found that patients, just like you, were having longer recovery times, prolonged injuries and not getting any better-- regardless of what nutritional supplements they were taking. Nutriex Nutrition is 100% focused on “Preventative” Health, meaning the focus and purpose of Nutriex is to prevent the very things that are wearing & tearing your body down. Nutriex Nutrition has incredible value due to the 35+ vitamins, minerals, antioxidants, plant sources and cartilage protectors found inside. They also contain natural, non-GMO ingredients that are researched and found to be safe, easily digestible & effective in the preventing and slowing down of degeneration in your body. Formulated for long-term health benefits, these nutrients are important for musculoskeletal, eye, cardiovascular, neurologic and immunologic health and also for cancer risk reduction. Imagine having a vitamin that is actually supported by research, supported by doctors of several specialties, and all contained in 1 capsule. Nutriex is life-changing—it has positively affected many peoples’ lives. We have seen individuals who are scheduled for knee and hip surgery postpone their surgery. They have been able to enjoy being active in their community, families and at home. We have seen people become healthier and less-reliant on pills and begin to enjoy a pain-free life. Check out https://nutriex.com/ for more information.